This week, I had the priveledge to interview debut author, Lara Chapman, on my blog. Her novel, Flawless, released this past Tuesday. If you haven't read my raving review, all I can say is you must check out her novel. It's amazing in all the right ways. Without futhur ado, please welcome Lara to Addicted 2 Novels! 1. How did you come up with the idea for Flawless, and why did you choose to retell the story of Cyrano de Bergerac? The answer to the first two questions is the same… I was brainstorming with my critique partners and we started looking at the great love stories that could be retold in a contemporary setting. Romeo and Juliet, Cinderella… those stories have been done and redone so well, I just couldn’t think of a way to spin them in a unique way and keep the basic story line in tact. Someone mentioned Cyrano, and it built from there. 2. For someone who hasn't heard of Flawless, how would you describe it to them? 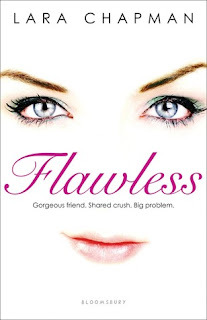 FLAWLESS is the story of two best friends who fall in love with the same guy. It’s about the heroine’s struggle to stay true to her best friend and help her win the guy, even though she wants him for herself. 3. Every girl thinks she has them, so I'm curious as to what you think your biggest "flaw" is. When I asked my kids what they thought my biggest flaw was, they both said what I was already thinking… control! I admit it – I’m a tiny bit of a control freak, especially when it comes to organization. 4. Are you currently working on any new projects? 5. What message would you like readers to take with them after reading Flawless? Be true to yourself! Be honest with yourself about what you want out of life and then go for it. Thank you, Lara, for dropping by, and an extra special thanks to Kate from Bloomsbury for putting all this together! For more about Flawless and Lara, be sure to check out her website. Also, Lara will be partipating in the Chills & Thrills tour so be sure to catch her while you can! I'm a new GFC follower btw!